The energy policy of the United States is determined by federal, state and local entities in the United States, which address issues of energy production, distribution, and consumption, such as building codes and gas mileage standards. Energy policy may include legislation, international treaties, subsidies and incentives to investment, guidelines for energy conservation, taxation and other public policy techniques. Several mandates have been proposed over the years, such as gasoline will never exceed $1.00/gallon (Nixon), and the United States will never again import as much oil as it did in 1977 (Carter), but no comprehensive long-term energy policy has been proposed, although there has been concern over this failure. Three Energy Policy Acts have been passed, in 1992, 2005, and 2007, which include many provisions for conservation, such as the Energy Star program, and energy development, with grants and tax incentives for both renewable energy and non-renewable energy. There is also criticism that federal energy policies since the 1973 oil crisis have been dominated by crisis-mentality thinking, promoting expensive quick fixes and single-shot solutions that ignore market and technology realities. Instead of providing stable rules that support basic research while leaving plenty of scope for American entrepreneurship and innovation, congresses and presidential administrations have repeatedly backed policies which promise solutions that are politically expedient, but whose prospects are doubtful, without adequate consideration of the dollar costs, environmental costs, or national security costs of their actions. State-specific energy-efficiency incentive programs also play a significant role in the overall energy policy of the United States. The United States refused to endorse the Kyoto Protocol, preferring to let the market drive CO2 reductions to mitigate global warming, which will require CO2 emission taxation. The administration of Barack Obama has proposed an aggressive energy policy reform, including the need for a reduction of CO2 emissions, with a cap and trade program, which could help encourage more clean renewable, sustainable energy development. Thanks to new technologies such as fracking, the United States has in 2014 resumed its former role as the top oil producer in the world. In the Colonial era the energy policy of the United States was for free use of standing timber for heating and industry. In the 19th century, new emphasis was placed on access to coal and its use for transport, heating and industry. Whales were rendered into lamp oil. Later, coal gas was fractionated for use as lighting and town gas. Natural gas was first used in America for lighting in 1816., it has grown in importance for use in homes, industry, and power plants, but natural gas production reached its U.S. peak in 1973, and the price has risen significantly since then. Coal provided the bulk of the US energy needs well into the 20th century. Most urban homes had a coal bin and a coal fired furnace. Over the years these were replaced with oil furnaces, not because of it being cheaper but because it was easier and safer. Coal remains far cheaper than oil. The biggest use of oil has come from the development of the automobile. 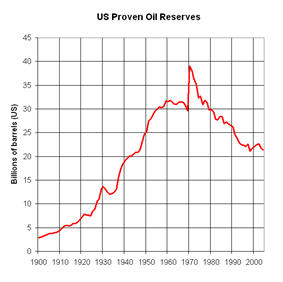 US oil reserves increased until 1970, and then began to decline. Oil became increasingly important to the United States, and, from the early 1940s, the US government and oil industry entered into a mutually beneficial collaboration to control global oil resources. By 1950, oil consumption exceeded that of coal. The abundance of oil in California, Texas, Oklahoma, as well as in Canada and Mexico, coupled with its low cost, ease of transportation, high energy density, and use in internal combustion engines, lead to its increasing use. Following World War II, oil heating boilers took over from coal burners along the Eastern Seaboard; diesel locomotives took over from coal-fired steam engines under dieselisation; oil-fired electricity plants were built; petroleum-burning buses replaced electric streetcars in a GM driven conspiracy, for which they were found guilty, and citizens bought gasoline powered cars. Interstate Highways helped make cars the major means of personal transportation. As oil imports increased, US foreign policy was inexorably drawn into Middle East politics, supporting oil-producing Saudi Arabia and patrolling the sea lanes of the Persian Gulf. Hydroelectricity was the basis of Nikola Tesla's introduction of the U.S. electricity grid, starting at Niagara Falls, NY in 1883. Electricity generated by major dams like the Jensen Dam, TVA Project, Grand Coulee Dam and Hoover Dam still produce some of the lowest-priced ($0.08/kWh), clean electricity in America. Rural electrification strung power lines to many more areas. Utilities have their rates set to earn a revenue stream that provides them with a constant 10% – 13% rate of return based on operating costs. Increases or decreases of the operating costs of electricity production are passed directly through to the consumers. The federal government provided substantially larger subsidies to fossil fuels than to renewables in the 2002–2008 period. Subsidies to fossil fuels totaled approximately $72 billion over the study period, representing a direct cost to taxpayers. Subsidies for renewable fuels, totaled $29 billion over the same period. In some cases, the U.S. has used its energy policy as a means to pursue other international goals. Richard Heinberg, a professor from Santa Rosa, California argues that a declassified CIA document shows that the U.S. used oil prices as leverage against the economy of the Soviet Union. Specifically, he argues that the U.S. intentionally worked with Saudi Arabia during the Reagan administration to keep oil prices low, thus decreasing the purchasing power of the Soviet Union's petroleum export industry. When combined with other U.S. efforts to drain Soviet resources, this was eventually a major cause in the dissolution of the Soviet Union. United States oil production peaked in 1970 and began to decline. In 2005 imports peaked at 60% of consumption. The United States receives approximately 84% of its energy from fossil fuels. This energy is used for transport, industry, and domestic use. The remaining portion comes primarily from Hydro and Nuclear stations. Americans constitute less than 5% of the world's population, but consumes 26% of the world's energy to produce 26% of the world's industrial output. They account for about 25% of the world's petroleum consumption, while producing only 6% of the world's annual petroleum supply. Almost all of Canada’s energy exports go to the United States, making it the largest foreign source of U.S. energy imports. Canada is the top source of U.S. imports of oil, gas. and electricity. 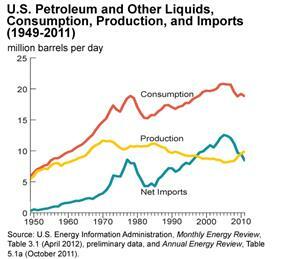 In 2012, the US produced 60% of the petroleum it used, the remainder being imported. The largest sources of imported oil were Canada, Saudi Arabia, Mexico, Venezuela, and Russia. Oil imports into the US peaked in 2005, when imports supplied 60% of US consumption; they have declined since, due both to increased domestic oil production, and reduced consumption. The 1973 oil embargo highlighted the vulnerability of the United States to oil supply disruptions when it depends on imports from nations that are either politically unstable or opposed to US interests. Perceived remedies include measures to reduce demand for petroleum (such as conservation or alternative fuels), increase the supply of petroleum (by increasing domestic production, or maintaining petroleum reserves), or enhance the reliability of foreign imports (through foreign policy). The Federal Department of Energy was started to direct the various approaches. Conservation. A National Maximum Speed Limit of 55 mph (88 km/h) was imposed to help reduce consumption, and Corporate Average Fuel Economy (aka CAFE) standards were enacted to downsize automobile categories. Year-round Daylight Saving Time was imposed, the United States Strategic Petroleum Reserve was created and the National Energy Act of 1978 was introduced. Alternate forms of energy and diversified oil supply resulted. Re-design of cities, telecommuting, mass transit, higher housing density and walking could also reduce automobile fuel consumption. Carpooling, flexcars, Smart cars, and shorter commutes could all reduce fuel use. Increasing supply. The United States Strategic Petroleum Reserve was created to augment supply in case of a national emergency. Alternative fuels. Two-thirds of U.S. oil consumption is in the transportation sector. The US – an important export country for food stocks – converted approximately 18% of its grain output to ethanol in 2008. Across the US, 25% of the whole corn crop went to ethanol in 2007. The percentage of corn going to biofuel is expected to go up. In 2006, U.S. Senators introduced the BioFuels Security Act. The proposal has been made for a hydrogen economy, in which cars and factories would be powered by hydrogen fuel cells. However, energy would have to be used to produce the hydrogen, and hydrogen cars have been called one of the least efficient, most expensive ways to reduce greenhouse gases. Other plans include making society carbon neutral and using renewable energy, including solar, wind, and methane sources. It has been suggested that automobiles could be powered by the following forms of energy: 60% by grid electricity, 20% by biofuels, and 20% by direct solar. Re-design of cities, telecommuting, mass transit, higher housing density and walking could also reduce automobile fuel consumption. Enhance reliability of foreign sources One purpose of American foreign policy, especially in the Middle East, is commonly seen as securing the continued flow of petroleum exports from the region. The proposed Keystone XL pipeline from Canada is widely perceived as a way to enhance the security of US petroleum supply. The United States is a net importer of natural gas, most of it by pipeline from Canada, with a smaller amount of LNG from other sources. Net gas imports into the US peaked in 2007, when the country imported 16.4 percent of the natural gas it consumed, and was the world's largest net importer of natural gas. By 2013, despite growing use of natural gas in the US, net imports had fallen to 5.0 percent of consumption. 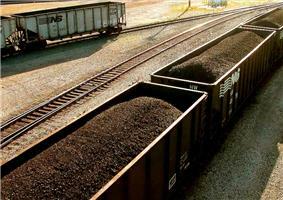 The United States mines more coal than it uses, and is an exporter of coal. The United States is a net importer of electricity from Canada, and a net exporter to Mexico. Overall, in 2012 the US had net electricity imports of 47 thousand gigawatt-hours, which was less than 1.2% of the electrical power generated within the US. Nuclear power in the United States depends largely on imported uranium. In 2011, US uranium mining provided 8 percent of the uranium concentrate loaded into nuclear reactors. The remainder was imported. Principal sources of imported uranium were Russia, Canada, Australia, Kazakhstan, and Namibia. Buildings and their construction consume more energy than transportation or industrial applications, and because buildings are responsible for the largest portion of greenhouse emissions, they have the largest impact on man-made climate change. The AIA has proposed making buildings carbon neutral by 2030, meaning that the construction and operation of buildings will not require fossil fuel energy or emit greenhouse gases, and having the U.S. reduce CO2 emissions to 40 to 60% below 1990 levels by 2050. Energy consumption can vary widely from state to state in the U.S. In 2012 for example, there was a large gap in electricity consumption by state between the top three states - Louisiana (1254 kWh/mo. ), Tennessee (1217 kWh/mo.) and Mississippi (1193 kWh/mo.) - and the bottom three states - Maine (531 kWh/mo. ), Hawaii (544 kWh/mo.) and Vermont (565 kWh/mo.). When President Carter created the U.S. Department of Energy in 1977, one of their first successful projects was the Weatherization Assistance Program. During the last 30 years, this program has provided services to more than 5.5 million low-income families. On average, low-cost weatherization reduces heating bills by 31% and overall energy bills by $358 per year at current prices. Increased energy efficiency and weatherization spending has a high return on investment. The “Energy Independence and Security Act of 2007” has a significant impact on U.S. Energy Policy. It includes funding to help improve building codes, and will make it illegal to sell incandescent light bulbs, as they are less efficient than fluorescents and LEDs. Technologies such as passive solar building design and zero energy buildings (ZEB) have demonstrated significant new-construction energy bill reductions. The “Energy Independence and Security Act of 2007” includes funding to increase the popularity of ZEBs, photovoltaics, and even a new solar air conditioning program. Many energy-saving measures can be added to existing buildings as retrofits, but others are only cost-effective in new construction, which is why building code improvements are being encouraged. The solution requires both improved incentives for energy conservation, and new energy sources. The Energy Independence and Security Act of 2007 increases average gas mileage to 35 mpg by 2020. The current administration and 2007 legislation are encouraging the near-term use of plug-in electric cars, and hydrogen cars by 2020. Toyota has suggested that their third-generation 2009 Prius may cost much less than the current model. Larger advanced-technology batteries have been suggested to make it plug-in rechargeable. Photovoltaics are an option being discussed to extend its daytime electric driving range. Improving solar cell efficiency factors will continue to make this a progressively more-cost-effective option. 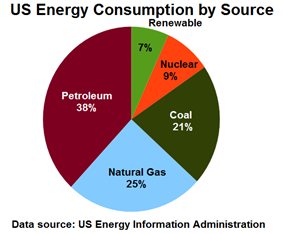 About 81% of all types of energy used in the United States is derived from fossil fuels. In 2012, the largest source of the country's energy came from petroleum (36%), followed by natural gas (27%), coal (18%), renewable sources (9%) and nuclear power (8%). Amory Lovins says that the sharp and steady cost reductions in solar power has been a "stunning market success". He says that solar, wind and cheap natural gas have significantly reduced the prospects of coal and nuclear power plants around the world. John Rowe, chair of Exelon (the largest nuclear power producer in the US), has said that the nuclear renaissance is dead. U.S. Imports of Crude Oil and Petroleum Products (Thousand Barrels), 1981–2010. The US consumes, in 2006, 20.8 million barrels (3,310,000 m3) of petroleum a day, of which 9 million barrels (1,400,000 m3) is motor gasoline. Transportation has the highest consumption rates, accounting for approximately 68.9% of the oil used in the United States in 2006, and 55% of oil use worldwide as documented in the Hirsch report. With approximately 5% of the world's population, the United States is responsible for approximately 25% of annual global oil consumption and according to 2008 estimates has a per-person daily consumption rate more than double that of the European Union. Automobiles are the single largest consumer of oil, consuming 40%, and are also the source of 20% of the nation's greenhouse gas emissions. The USA has about 22 billion barrels (3.5×109 m3) reserves while consuming about 7.6 billion barrels (1.21×109 m3) per year. This has created pressure for additional drilling. European gasoline prices were artificially raised to $4 per gallon through taxation long before they reached $4/gallon in the U.S., leading to better fuel economy. Problems associated with oil supply include volatile oil prices, increasing world and domestic petroleum product demand, dependence on unstable imported foreign oil, falling domestic production (peak oil), and declining infrastructure, like the Alaska pipeline and oil refineries. American dependence on imports grew from 10% in 1970 to 65% by the end of 2004. The Energy Information Administration projects that U.S. oil imports will remain flat and consumption will grow, so net imports will decline to 54% of U.S. oil consumption by 2030. 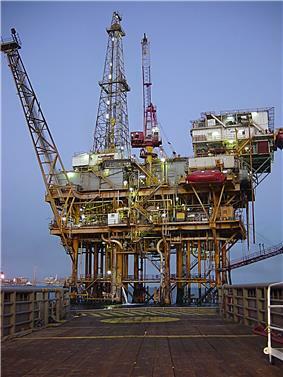 The subject of continued exploration for offshore drilling in the United States is a perennial debate, one which was heavily influenced in 2010 by the BP Macondo oil spill in the Gulf of Mexico. America is self-sufficient in coal. Indeed, it has several hundred years' supply of it. The United States trend in coal use has been rising from 1950 through 2007, when coal production and consumption more than doubled. The population of the US has almost doubled in this time period as well, while the per capita energy use has been declining since 1978. Most electricity (52% in 2000) in the country is generated from coal-fired power plants: in 2006, more than 90% of coal consumed was used to generate electricity. In 1950, about 19% percent of the coal consumed was for electricity generation. In terms of the production of energy from domestic sources, from 1885 through 1951, coal was the leading source of energy in the United States. Crude oil and natural gas then vied for that role until 1982. Coal regained the position of the top domestic resource that year and again in 1984, and has retained it since. The US burns 1 billion tons of coal every year. Concern for climate change has led to a call for a moratorium on all coal consumption, unless carbon capture is utilized. Coal is the largest potential source of CO2 emissions. Integrated Gasification Combined Cycle (IGCC) is the cleanest currently operational coal-fired electricity generation technology. FutureGen is an experimental U.S. research project to investigate the possibility of sequestering IGCC CO2 emissions underground. Natural gas production and consumption quadrupled between 1950 and 1970 to 20×10^12 cu ft (570 km3), but declined steadily to stabilize in 1986. Since then, the United States imports a rising share of its gas. In 2008 consumption of natural gas stood at 23.2×10^12 cu ft (660 km3), while domestic production was at 20.6×10^12 cu ft (580 km3). Approximately 3.0×10^12 cu ft (85 km3) were imported, mainly by pipelines from Canada, which accounted for 90% of foreign supplies, while the remainder is delivered by liquefied natural gas (LNG) tankers carrying gas from five different countries. The largest gas producing states in 2007 were Texas (30%), Wyoming (10%), Oklahoma (9%) and New Mexico (8%), while 14% of the country's production came from the federal offshore lands in the Gulf of Mexico. Recent development in hydraulic fracturing and horizontal drilling have increased interest for shale gas across the United States in recent years. Leading fields are the Barnett Shale in Texas and the Antrim Shale in Michigan. Natural gas reserves in the United States were 35% higher in 2008 than two years earlier largely due to shale gas discoveries. The United States is the world's largest supplier of commercial nuclear power. As of 2010, the demand for nuclear power is softening in America, and some companies have withdrawn their applications for licenses to build. Ground has been broken on two new nuclear plants with a total of four reactors. The only reactor currently under construction in America, at Watts Bar, Tennessee, was begun in 1973 and may be completed in 2012. Of the 104 reactors now operating in the U.S., ground was broken on all of them in 1974 or earlier. In September 2010, Matthew Wald from the New York Times reported that "the nuclear renaissance is looking small and slow at the moment". In August 2011, the head of America's largest nuclear utility said that this was not the time to build new nuclear plants, not because of political opposition or the threat of cost overruns, but because of the low price of natural gas. John Rowe, head of Exelon, said “Shale [gas] is good for the country, bad for new nuclear development". Following the 2011 Japanese nuclear accidents, the U.S. Nuclear Regulatory Commission has announced it will launch a comprehensive safety review of the 104 nuclear power reactors across the United States, at the request of President Obama. The Obama administration "continues to support the expansion of nuclear power in the United States, despite the crisis in Japan". Following the Japanese nuclear emergency, public support for building nuclear power plants in the U.S. dropped to 43%, slightly lower than it was immediately after the Three Mile Island accident in 1979, according to a CBS News poll. In his 2012 state-of-the-union address, Barack Obama said that America needs “an all-out, all-of-the-above strategy that develops every available source of American energy.” President Obama boasted about a Michigan wind turbine factory, America's healthy supplies of natural gas and widespread oil exploration. He urged Congress to pass tax incentives for energy efficiency, clean energy, and an end to oil-company subsidies, but made no mention of nuclear power. In 2013, four aging reactors in the USA were permanently closed before their licenses expired because of high maintenance and repair costs at a time when natural gas prices have fallen: San Onofre 2 and 3 in California, Crystal River 3 in Florida, and Kewaunee in Wisconsin. The state of Vermont is trying to close Vermont Yankee, in Vernon. New York State is seeking to close Indian Point in Buchanan, 30 miles from New York City. Loss of nuclear generating capacity is expected to be offset by the five new nuclear reactors currently under construction, with a proposed combined capacity of more than 5,000 MW. The Shepherds Flat Wind Farm is an 845 megawatt (MW) wind farm in the U.S. state of Oregon. The Copper Mountain Solar Facility is a 150 MW solar photovoltaic power plant in Boulder City, Nevada. Renewable energy in the United States accounted for 12.9 percent of the domestically produced electricity in 2013. Renewable energy reached a major milestone in the first quarter of 2011, when it contributed 11.7 percent of total U.S. energy production (2.245 quadrillion BTUs of energy), surpassing energy production from nuclear power (2.125 quadrillion BTUs). 2011 was the first year since 1997 that renewables exceeded nuclear in US total energy production. Hydroelectric power is currently the largest producer of renewable power in the U.S. It produced around 6.2% of the nation's total electricity in 2010 which was 60.2% of the total renewable power in the U.S. 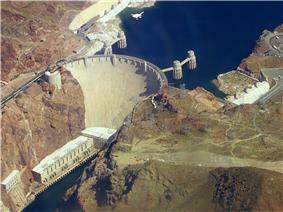 The United States is the fourth largest producer of hydroelectricity in the world after China, Canada and Brazil. 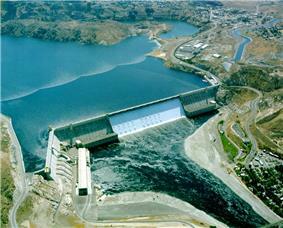 The Grand Coulee Dam is the 5th largest hydroelectric power station in the world. U.S. wind power installed capacity now exceeds 60,000 MW and supplies 3% of the nation's electricity. Texas is firmly established as the leader in wind power development, followed by Iowa and California. 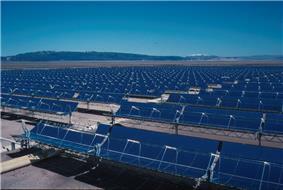 Since the U.S. pioneered the technology with Solar One, several solar thermal power stations have also been built. 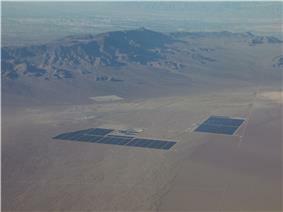 The largest of these solar thermal power stations is the SEGS group of plants in the Mojave Desert with a total generating capacity of 354 MW, making the system the largest solar plant of any kind in the world. The largest photovoltaic power plant in North America is the over 200 MW Agua Caliente Solar Project in Yuma County, Arizona. The Geysers in Northern California is the largest complex of geothermal energy production in the world. With 2,957 MW of installed geothermal capacity, the United States remains the world leader with 30% of the online capacity total. As of early 2009, 120 new projects are underway. When developed, these projects could potentially supply up to 3,979 MW of power, meeting the needs of about 4 million homes. At this rate of development, geothermal production in the United States could exceed 15,000 MW by 2025. The development of renewable energy and energy efficiency marks "a new era of energy exploration" in the United States, according to President Barack Obama. In a joint address to the Congress on February 24, 2009, President Obama called for doubling renewable energy within the next three years. In his 2012 State of the Union address, President Barack Obama restated his commitment to renewable energy and mentioned the long-standing Interior Department commitment to permit 10,000 MW of renewable energy projects on public land in 2012. President Barack Obama's American Recovery and Reinvestment Act of 2009 included more than $70 billion in direct spending and tax credits for clean energy and associated transportation programs. This policy-stimulus combination represents the largest federal commitment in U.S. history for renewable energy, advanced transportation, and energy conservation initiatives. As a result of these new initiatives, many more utilities are expected to strengthen their clean energy programs. In February 2011, the U.S. Department of Energy launched its SunShot Initiative, a collaborative national effort to cut the total cost of photovoltaic solar energy systems by 75% by 2020. Reaching this goal would make unsubsidized solar energy cost-competitive with other forms of electricity. In recent years there has been an increased interest in biofuels – bioethanol and biodiesel – derived from common agricultural staples or waste. Increased domestic production of these fuels could reduce US expenditure on foreign oil and improve energy security if methods of producing and transporting the fuels do not involve heavy inputs of fossil fuels, as current agriculture does. Most cars on the road today in the U.S. can run on blends of up to 10% ethanol, and motor vehicle manufacturers already produce vehicles designed to run on much higher ethanol blends. Portland, Oregon, recently became the first city in the United States to require all gasoline sold within city limits to contain at least 10% ethanol. Ford, Daimler AG, and GM are among the automobile companies that sell “flexible-fuel” cars, trucks, and minivans that can use gasoline and ethanol blends ranging from pure gasoline up to 85% ethanol (E85). By mid-2006, there were approximately 6 million E85-compatible vehicles on U.S. roads. The Renewable Fuels Association counts 113 U.S. ethanol distilleries in operation and another 78 under construction, with capacity to produce 11.8 billion gallons within the next few years. The Energy Information Administration (EIA) predicts in its Annual Energy Outlook 2007 that ethanol consumption will reach 11.2 billion US gallons (42,000,000 m3) by 2012, outstripping the 7.5 billion US gallons (28,000,000 m3) required in the Renewable Fuel Standard that was enacted as part of the Energy Policy Act of 2005. Expanding ethanol fuel (and biodiesel) industries provide jobs in plant construction, operations, and maintenance, mostly in rural communities. According to the Renewable Fuels Association, the ethanol industry created almost 154,000 U.S. jobs in 2005 alone, boosting household income by $5.7 billion. It also contributed about $3.5 billion in tax revenues at the local, state, and federal levels. In recent years, there has been criticism about the production of ethanol fuel from food crops. However, second generation biofuels are now being produced from a much broader range of feedstocks including the cellulose in dedicated energy crops (perennial grasses such as switchgrass and Miscanthus giganteus), forestry materials, the co-products from food production, and domestic vegetable waste. Produced responsibly they are sustainable energy sources that need not divert any land from growing food, nor damage the environment. 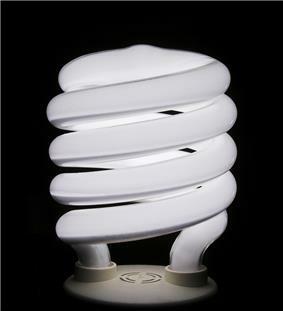 A spiral-type integrated compact fluorescent lamp, which has been popular among North American consumers since its introduction in the mid 1990s. 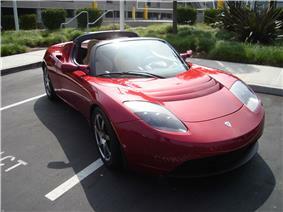 The Tesla Roadster, first delivered in 2008, uses Li-Ion batteries to achieve 220 miles per charge, while also capable of going 0-60 in under 4 seconds. There are many different types of energy efficiency innovations and these include: efficient water heaters; improved refrigerators and freezers; advanced building control technologies and advances in heating, ventilation, and cooling (HVAC); smart windows that adapt to maintain a comfortable interior environment; a steady stream of new building codes to reduce needless energy use, and compact fluorescent lights. Improvements in buildings alone, where over sixty-percent of all energy is used, save tens of billions of dollars per year. Several states, including California, New York, Rhode Island, and Wisconsin, have consistently deployed energy efficiency innovations. Their state planners officials, citizens, and industry leaders, have found these to be very cost-effective, often providing greater service at lower personal and social cost than simply adding more fossil-fuel based supply technologies. This is the case for several reasons. Energy efficient technologies often represent upgrades in service through superior performance (e.g. higher quality lighting, heating and cooling with greater controls, or improved reliability of service through greater ability of utilities to respond to time of peak demand). So these innovations can provide a better, less expensive, service. A wide range of energy efficient technologies have ancillary benefits of improved quality of life, such as advanced windows that not only save on heating and cooling expenses, but also make the work-place or home more comfortable. Another example is more efficient vehicles, which not only save immediately on fuel purchases, but also emit less pollutants, improving health and saving on medical costs to the individual and to society. In 1994, Amory Lovins developed the design concept of the Hypercar. This vehicle would have ultra-light construction with an aerodynamic body using advanced composite materials, low-drag design, and hybrid drive. Designers of the Hypercar claim that it would achieve a three- to fivefold improvement in fuel economy, equal or better performance, safety, amenity, and affordability, compared with today's cars. Lovins says the commercialisation of the Hypercar began in 2014, with the production of the all-carbon electric BMW i-3 family and the 313 miles per gallon Volkswagen XL1. An incentive resulting from US energy policy is a factor that provides motive for a specific course of action regarding the use of energy. In the U.S. most energy policy incentives take the form of financial incentives. Examples of these include tax breaks, tax reductions, tax exemptions, rebates, loans and specific funding. Throughout US history there have been many incentives created through U.S. energy policy. Most recently the Energy Policy Act of 2005, Energy Independence and Security Act of 2007, and Emergency Economic Stabilization Act of 2008, each promote various energy efficiency improvements and encourage development of specific energy sources. U.S. Energy policy incentives can serve as a strategic manner to develop certain industries that plan to reduce America’s dependence on foreign petroleum products and create jobs and industries that boost the national economy. The ability to do this depends upon which industries and products the government chooses to subsidize. The 2012 budget that President Obama submitted to Congress calls for a 70 percent increase over the 2011 allocation for federal research and development activities related to renewable energy. The Office of Science in the Department of Energy would receive $2.0 billion for basic energy sciences to discover new ways to produce, store and use energy. Included in that amount are allocations of $457 million for solar energy; $341 million for biofuels and biomass R&D, including a new reverse auction to promote advanced biofuels; and more than doubling investment in geothermal energy to $102 million. The budget includes funding to accelerate the deployment of new models of energy research pioneered in the last several years, including $550 million for the Advanced Research Projects Agency–Energy, a program that supports breakthrough ideas. Public investment can enable the development of infrastructure projects through the use of public funds, grants, loans or other financing options. These funds provide a means for allocating the capital necessary for the development of renewable energy technologies. Federal tax incentives can be designed to accelerate market adoption, create jobs, encourage investment in a public good (reduced pollution) or encourage investment in renewable technology research and development. The Production Tax Credit (PTC) reduces the federal income taxes of qualified tax-paying owners of renewable energy projects based on the electrical output (measured in kWh) of grid-connected renewable energy facilities. The Investment Tax Credit (ITC) reduces federal income taxes for qualified tax-paying owners based on dollars of capital investment in renewable energy projects. The Advanced Energy Manufacturing Tax Credit (MTC) awards tax credits to new, expanded, or re-equipped domestic manufacturing facilities that support clean energy development. The Department of Energy’s Loan Guarantee Program, established by the Energy Policy Act of 2005 and enhanced by the American Recovery and Reinvestment Act of 2009, attempts to pave the way for investor support of clean energy projects by providing a guarantee of financing up to 80% of the project cost. The program is scheduled to end on September 30, 2011, unless Congress passes further legislation. A Renewable Portfolio Standard (RPS) is a mandate that requires electricity providers to supply to their customers a minimum amount of power from renewable sources, usually as a percentage of total energy use. As of June 2010, such standards have been enacted in 31 U.S. states and the District of Columbia. For example, Governor Jerry Brown signed legislation requiring California's utilities to get 33 percent of their electricity from renewable energy sources by the end of 2020. Congress has considered a national RPS since 1997: the Senate has passed legislation three times, and the House once. As of April 2011, both houses have not acted in unison to pass legislation. Consumers who purchase hybrid vehicles are eligible for a tax credit that depends upon the type of vehicle and the difference in fuel economy in comparison to vehicles of similar weights. These credits range from several hundred dollars to a few thousand dollars. Homeowners can receive a tax credit up to $500 for energy efficient products like insulation, windows, doors, as well as heating and cooling equipment. Homeowners who install solar electric systems can receive a 30% tax credit and homeowners who install small wind systems can receive a tax credit up to $4000. Geothermal heat pumps also qualify for tax credits up to $2,000. Recent energy policy incentives have provided, among other things, billions of dollars in tax reductions for nuclear power, fossil fuel production, clean coal technologies,renewable electricity production, and conservation and efficiency improvements. Although exceeded by China, the United States has historically been the world's largest producer of greenhouse gases. Some states, however, are much more prolific polluters than others. The state of Texas produces approximately 1.5 trillion pounds of carbon dioxide yearly, more than every nation in the world except five (and the United States): China, Russia, Japan, India, and Germany. Despite signing the Kyoto Protocol, the United States has neither ratified nor withdrawn from it. In the absence of ratification it remains non-binding on the US. The Obama Administration has promised to take specific action towards mitigation of climate change. In addition, at state and local levels, there are currently a number of initiatives. As of March 11, 2007, mayors of 418 US cities in 50 states have endorsed the Kyoto protocol, after Mayor Greg Nickels of Seattle started a nationwide effort to get cities to agree to the protocol. As of January 18, 2007, eight Northeastern US states are involved in the Regional Greenhouse Gas Initiative (RGGI), a state level emissions capping and trading program. On August 31, 2006, the California Legislature reached an agreement with Governor Arnold Schwarzenegger to reduce the state's greenhouse-gas emissions, which rank at 12th-largest carbon emitter in the world, by 25 percent by the year 2020. This resulted in the Global Warming Solutions Act which effectively puts California in line with the Kyoto limitations, but at a date later than the 2008–2012 Kyoto commitment period. In the non-binding 'Washington Declaration' agreed on February 16, 2007, the United States, together with Presidents or Prime Ministers from Canada, France, Germany, Italy, Japan, Russia, United Kingdom, Brazil, China, India, Mexico and South Africa agreed in principle on the outline of a successor to the Kyoto Protocol. They envisage a global cap-and-trade system that would apply to both industrialized nations and developing countries, and hoped that this would be in place by 2009. Chemistry Professor Nathan Lewis at Caltech estimates that to keep atmospheric carbon levels below 750 ppm, a level at which serious climate change would occur, by the year 2050, the United States would need to generate twice as much energy from renewable sources as is generated by all power sources combined today. However, current research indicates that even carbon dioxide concentrations in excess of 450 ppm would result in irreversible global climate change. The book, Carbon-Free and Nuclear-Free, A Roadmap for U.S. Energy Policy, by Arjun Makhijani, argues that in order to meet goals of limiting global warming to 2 °C, the world will need to reduce CO2 emissions by 85% and the U.S. will need to reduce emissions by 95%, which can be extended to within a few percent plus or minus of carbon free with little additional change. The book calls for phasing out use of oil, natural gas, and coal which does not use carbon sequestration by the year 2050. Effective delivered energy is projected to increase from about 75 Quadrillion Btu in 2005 to about 125 Quadrillion in 2050, but due to efficiency increases, the actual energy input is projected to increase from about 99 Quadrillion Btu in 2005 to about 103 Quadrillion in 2010 and then to decrease to about 77 Quadrillion in 2050. Petroleum use is projected to increase until 2010 and then linearly decrease to zero by 2050. The roadmap calls for nuclear power to decrease to zero at the same time, with the reduction also beginning in 2010. In his book Hell and High Water, author Joseph Romm calls for the rapid deployment of existing technologies to decrease carbon emissions. 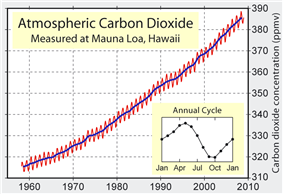 In a follow-up article in Nature.com in June 2008, he argues that "If we are to have confidence in our ability to stabilize carbon dioxide levels below 450 p.p.m. emissions must average less than [5 billion metric tons of carbon] per year over the century. This means accelerating the deployment of the 11 wedges so they begin to take effect in 2015 and are completely operational in much less time than originally modelled by Socolow and Pacala." In 2012, the National Renewable Energy Laboratory assessed the technical potential for renewable electricity for each of the 50 states, and concluded that each state has technical potential for renewable electricity, mostly from solar power and wind power, greater than its current electricity consumption. The report cautions: "Note that as a technical potential, rather than economic or market potential, these estimates do not consider availability of transmission infrastructure, costs, reliability or time-of-dispatch, current or future electricity loads, or relevant policies." Long distance electric power transmission results in energy loss, through electrical resistance, heat generation, electromagnetic induction and less-than-perfect electrical insulation. In 1995, these losses were estimated at 7.2%. Energy generation and distribution can be more efficient the closer it is to the point of use, if conducted in a high-efficiency generator, such as a CHP. In the generation and delivery of electrical power, system losses along the delivery chain are pronounced. Of five units of energy going into most large power plants, only about one unit of energy is delivered to the consumer in a usable form. A similar situation exists in gas transport, where compressor stations along pipelines use energy to keep the gas moving, or where gas liquefaction/cooling/regasification in the liquiefied natural gas supply chain uses a substantial amount of energy, even though the scale of the loss is not as pronounced as it is in electricity. Distributed generation is a means of reducing total and transmission losses. The EPA has the authority to regulate greenhouse gas emissions, under the Clean Air Act, and is one of the agency's seven priorities. 74% are concerned about climate change. 80% think their Government should do more to tackle global warming. 84% think that the US is too dependent on fossil fuels. 72% think that the US is too reliant on foreign oil. 79% think that the US Government should do more to increase the number of hybrid cars that are sold. 67% think that the US Government should allow more off shore drilling. The public is also quite clear on its priorities when it comes to promoting energy conservation versus increasing the supply of oil, coal, and natural gas. When asked which of these should be the higher priority, the public chooses energy conservation by a very wide 68 percent-to-21 percent margin. The public also predominantly believes that the need to cut down on energy consumption and protect the environment means increased energy efficiency should be mandated for certain products. Ninety-two percent of Americans now support such requirements. However, when energy policy and climate change are compared to other issues, they are rated extremely low in terms of importance. A Pew Research Center poll on public priorities for 2011 found that global warming ranked last of twenty-two possible policy priorities. The same survey in 2012 found similar results. The Gallup organization found that from 2009 through the latest poll in March 2013, public opinion has been nearly evenly split on whether to give priority to the environment or to developing energy sources such as oil, gas, and coal. This represents a shift from poll results from 2001 through 2008, when clear pluralities of Americans wanted environmental concerns to take priority over developing fossil fuel resources. However, public opinion still heavily favors an emphasis on wind and solar energy (59 percent) over fossil fuels (31 percent). The current head of the U.S. Department of Energy under the Obama administration is Dr. Ernest Moniz, who succeeded Dr. Steven Chu in May 2013. Catalyze the timely, material, and efficient transformation of the nation’s energy system and secure U.S. leadership in clean energy technologies. Maintain a vibrant U.S. effort in science and engineering as a cornerstone of our economic prosperity with clear leadership in strategic areas. Enhance nuclear security through defense, nonproliferation, and environmental efforts. Establish an operational and adaptable framework that combines the best wisdom of all Department stakeholders to maximize mission success. In December 2009, the United States Patent and Trademark Office announced the Green Patent Pilot Program. The program was initiated to accelerate the examination of patent applications relating to certain green technologies, including the energy sector. The pilot program was initially designed to accommodate 3,000 applications related to certain green technology categories, and the program was originally set to expire on December 8, 2010. In May, 2010, the USPTO announced that it would expand the pilot program. ^ Jimmy Carter. "Crisis of Confidence Speech 1979". Cartercenter.org. Retrieved 2012-03-30. ^ "CRS Report for Congress". Digital.library.unt.edu. Retrieved 2012-03-30. ^ a b "Energy Independence and Security Act of 2007 (Enrolled as Agreed to or Passed by Both House and Senate)". Retrieved 2008-01-18. ^ Grossman, Peter (2013). U.S. Energy Policy and the Pursuit of Failure. Cambridge University Press. p. 416. ^ Hamilton, Michael S. 2013. Energy Policy Analysis: A Conceptual Framework. Armonk, NY: M.E. Sharpe, Inc.
^ "Database of State Incentives for Renewables & Efficiency". Dsireusa.org. Retrieved 2012-03-30. ^ Daly, Herman E. (2006). "Sustainable Development – Definitions, Principles, Policies". In Keiner, Marco. The Future of Sustainability. Springer. p. 257. ^ Smith, Grant (4 July 2014). "U.S. is now world's biggest oil producer". www.chicagotribune.com (Bloomberg News). Retrieved 4 July 2014. ^ a b c "Energy in the United States: 1635–2000 – Electricity". ^ Vivian, John. "Wood and Coal Stove Advisory". Motherearthnews.com. Retrieved 2012-03-30. ^ "Petroleum Timeline". United States Department of Energy. Retrieved 2007-07-04. ^ "Energy in the United States: 1635–2000 – Coal". United States Department of Energy. Retrieved 2007-07-04. ^ "Energy in the United States: 1635–2000 – Total Energy". United States Department of Energy. Retrieved 2007-07-04. ^ "Energy in the United States: 1635–2000 – Petroleum". United States Department of Energy. Retrieved 2007-07-04. ^ "Niagara Falls History of Power". Niagarafrontier.com. Retrieved 2012-03-30. ^ "Energy in the United States: 1635–2000 – Renewable". United States Department of Energy. Retrieved 2007-07-04. ^ "Energy – It Just Doesn't Add Up | Renewable Energy News Article". Renewableenergyworld.com. Retrieved 2012-03-30. ^ Erwin, Jerry (2006-10-09). "The Challenges Facing the Intelligence Community Regarding Global Oil Depletion". Portland Peak Oil. Retrieved 2009-04-29. ^ "Greenhouse Gases, Climate Change, and Energy". United States Department of Energy. 2004-04-02. Retrieved 2007-07-04. ^ "ENERGY INFOCARD – United States". ^ "SEI: Energy Consumption". Solarenergy.org. Retrieved 2012-03-30. ^ a b "EIA – Petroleum Basic Data". Eia.doe.gov. Retrieved 2012-03-30. ^ How dependent are we on foreign oil? 10 May 2013. ^ Jeffrey P. Bialos, "Oil imports and natiional security", Univ. of Pennsylvania Journal of International Business Law, 1989, v.11 n.2 p.235-300. ^ "25th Anniversary of the 1973 Oil Embargo". United States Department of Energy. 1998-03-09. Retrieved 2007-07-04. ^ "Performance Profiles of Major Energy Producers 1993" (PDF). United States Department of Energy. Retrieved 2007-07-04. See page 48. ^ a b "Petroleum Chronology of events 1970–2000". United States Department of Energy. May 2002. Retrieved 2007-07-04. ^ Kathleen Kingsbury (2007-11-16). "After the Oil Crisis, a Food Crisis?". Time Magazine. Retrieved 2008-04-28. ^ "Global warming rage lets global hunger grow". London: Telegraph. 2011-05-31. Retrieved 2012-03-30. ^ "Hydrogen Economy Fact Sheet". ^ Robert S. Boyd, McClatchy Newspapers. "Hydrogen cars may be a long time coming". Mcclatchydc.com. Retrieved 2012-03-30. ^ Bloomberg, National poll, 11 Dec. 2013. ^ US EIA, Natural gas year-in-review 2008, 2009. ^ US EIA, International Energy Statistics, accessed 10 Aug. 2014. 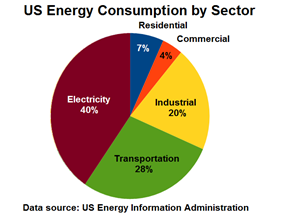 ^ US Energy Information Administration, Imports and exports of electricity, and Electricity: summary statistics for the United States, accessed 21 Dec. 2013. ^ US EIA, Energy daily, 11 July 2011. ^ "Architects and Climate Change". Aia.org. 2011-12-13. Retrieved 2012-03-30. ^ "Electricity Rates and Usage in the United States". Electricity Local. Retrieved 2014-05-12. ^ "Weatherization Assistance Program". Eere.energy.gov. 2012-01-30. Retrieved 2012-03-30. ^ "Communities of the Future" (PDF). Retrieved 2012-03-30. ^ "2009 Toyota Prius: Spy Report". Popularmechanics.com. 2007-02-07. Retrieved 2012-03-30. ^ Stahl, Andreas. "Ultra-Green: Radical 100-MPG Toyota Prius in the Works for 2009". Edmunds.com. Retrieved 2012-03-30. ^ Amory Lovins (March–April 2012). "A Farewell to Fossil Fuels". Foreign Affairs. ^ a b "Basic Petroleum Statistics". ^ "Domestic Demand for Refined Petroleum Products by Sector". U.S.
^ "CIA – The World Factbook – European Union". Cia.gov. Retrieved 2009-04-26. ^ "CIA – The World Factbook – United States". Cia.gov. Retrieved 2009-04-26. ^ "Gasoline Tops $5 A Gallon In Gorda". Theksbwchannel.com. Retrieved 2012-03-30. ^ "Fuel Prices Increase Nationwide as California Braces for $4/Gallon Gas in ‘08". Awmanet.org. Retrieved 2012-03-30. ^ Tertzakian, Peter (2005-11-15). "The U.S. Senate's Oil Spill". ^ "How Dependent Is the United States on Foreign Oil? – eia.doe.gov". Tonto.eia.doe.gov. 2008-08-22. Retrieved 2009-04-26. ^ Bonskowski, Richard F. (2001-03-27). "Energy Information Administration Statistics and Projections for U.S. Coal Supply and Demand: U.S. Coal, Domestic and International Issues" (PDF). ^ Benson, Sally M. "Carbon Dioxide Capture and Storage in Deep Geologic Formations" (PDF). ^ "Coal – A Fossil Fuel". ^ "U.S. population hits 300 million mark". MSNBC. Retrieved 2012-03-30. ^ "U.S. Per Capita Use of Energy". Eia.doe.gov. Retrieved 2012-03-30. ^ Energy in the United States: 1635–2000 United States Energy Information Administration, United States Department of Energy. ^ "Human-Related Sources and Sinks of Carbon Dioxide". Epa.gov. 2006-06-28. Retrieved 2012-03-30. ^ Rachel Barron (2007-10-15). "New Policy Could Put CO2 Underground". Greentechmedia.com. Retrieved 2012-03-30. ^ a b Energy Information Administration. "Natural Gas Explained : Where Our Natural Gas Comes From". Retrieved 2009-12-17. ^ Mouawad, Jad (17 June 2009). "Estimate places natural gas reserves 35% higher". The New York Times. Retrieved 2009-10-25. ^ a b Matthew L. Wald (December 7, 2010). "Nuclear ‘Renaissance’ Is Short on Largess". ^ a b "Team France in disarray: Unhappy attempts to revive a national industry". The Economist. December 2, 2010. ^ Matthew L. Wald. (September 23, 2010). "Aid Sought for Nuclear Plants". Green (The New York Times). ^ a b "America’s nuclear industry struggles to get off the floor". The Economist. Feb 18, 2012. ^ JulieAnn McKellogg (March 18, 2011). "US Nuclear Renaissance Further Crippled by Japan Crisis". ^ Michael Cooper (March 22, 2011). "Nuclear Power Loses Support in New Poll". The New York Times. ^ a b Matthew Wald (June 14, 2013). "Nuclear Plants, Old and Uncompetitive, Are Closing Earlier Than Expected". New York Times. ^ US Energy Information Administration, Lower power prices and high repair costs drive nuclear retirements 2 July 2013. ^ US Energy Information Administration, Electric Power Monthly, January 2013. ^ US Energy Information Administration, Total Energy. 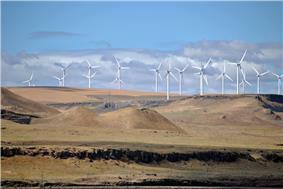 ^ "Q3 Report: Rebounding U.S. Wind Industry Stays Ahead of Sluggish 2010". Renewable Energy World. 26 October 2011. ^ "US wind power capacity up in '09, but jobs stalled". Reuters. 2010-01-26. ^ REN21 (2009). Renewables Global Status Report: 2009 Update p. 12. 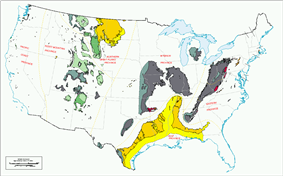 ^ "Update: The State of U.S. Geothermal Production and Development". Renewableenergyworld.com. Retrieved 2012-03-30. ^ Lindsay Morris (25 January 2012). """Obama: Sticking to "Promise of Clean Energy. Renewable Energy World. ^ Clean Edge (2009). Clean Energy Trends 2009 pp. 1-4. ^ DOE's SunShot Program Aims to Reach Competitive Solar By 2020. Fast Company, Feb. 4, 2011. ^ "SunShot Initiative About page, Accessed Jan. 20, 2012". .eere.energy.gov. 2011-11-16. Retrieved 2012-03-30. ^ Introduction: The Clean Tech Opportunity p. 3. ^ "Industrial Biotechnology Is Revolutionizing the Production of Ethanol Transportation Fuel". Bio.org. Retrieved 2012-03-30. ^ "Financial Times: OECD Warns Against Biofuels Subsidies". ^ "Global Science Forum Conference on Scientific Challenges for Energy Research: Energy At The Crossroads" (PDF). ^ "Hydrogen injection could boost biofuel production". Environment.newscientist.com. Retrieved 2012-03-30. ^ Oxburgh, Ron. Fuelling hope for the future, Courier Mail, 15 August 2007. ^ Sustainable biofuels: prospects and challenges p. 2. ^ "Philips Tornado Asian Compact Fluorescent". Philips. Retrieved 2007-12-24. ^ a b c "Opportunities for Greenhouse Gas Emissions Reductions" (PDF). Retrieved 2012-03-30. ^ Hypercars, hydrogen, and the automotive transition International Journal of Vehicle Design, Vol. 35, Nos. 1/2, 2004. ^ Diesendorf, Mark (2007). Greenhouse Solutions with Sustainable Energy, UNSW Press, pp. 191–192. ^ John Vidal (18 February 2014). "Amory Lovins: energy visionary sees renewables revolution in full swing". The Guardian. ^ Budget of the United States Government, Fiscal Year 2012, Department of Energy U.S. Office of Management and Budget, 2011. Retrieved 2011-04-12. ^ U.S. Renewable Energy Quarterly Report American Council on Renewable Energy, October 2010. Retrieved 2011-04-12. ^ David R. Baker (April 12, 2011). "Brown signs law requiring 33% renewable energy". ^ Comparative Analysis of Three Proposed Federal Renewable Electricity Standards National Renewable Energy Laboratory, NREL/TP-6A2-45877, May 2009. ^ Rubin, Ofir D. et al. 2008. Implied Objectives of U.S. Biofuel Subsidies. Iowa State University. ^ "Summary of the Credit for Qualified Hybrid Vehicles". Irs.gov. Retrieved 2012-03-30. ^ "Consumer Energy Tax Incentives". Energy.gov. 2011-06-30. Retrieved 2012-03-30. ^ Raupach, M.R. et al. (2007) emissions. "2"Global and regional drivers of accelerating CO Proc. Nat. Acad. Sci. 104(24): 10288–93. ^ Borenstein, Seth (04-06-2007). "Blame Coal: Texas Leads in Overall Emissions". USA Today. Retrieved 2007-06-06. ^ "US Climate Protection Agreement Home Page". Archived from the original on 2006-09-30. Retrieved 2006-11-07. ^ "Regional Greenhouse Gas Initiative". Retrieved 2006-11-07. ^ Wintour, Patrick (2006-08-01). "Blair signs climate pact with Schwarzenegger". London: The Guardian. Retrieved 2007-07-07. ^ "Politicians sign new climate pact". BBC News. 2007-02-16. Retrieved 2012-03-30. ^ "Guardian Unlimited: Global leaders reach climate change agreement". London: Environment.guardian.co.uk. 2007-02-16. Retrieved 2012-03-30. ^ Post a Comment. "U.S. Stabilization Wedges: Scientific American". Sciam.com. Retrieved 2012-03-30. ^ "Renewable Energy Technical Potential". National Renewable Energy Laboratory. Retrieved 2012-09-01. , p.2. ^ "Transmission and distribution technologies" (PDF). Retrieved 2008-01-18. ^ "Technology Options for the Near and Long Term" (PDF). ^ "Electric System Losses to Inefficiency" (PDF). Retrieved 2012-03-30. ^ a b "Total Energy – Data – U.S. Energy Information Administration (EIA)". Eia.doe.gov. Retrieved 2013-04-14. ^ "CIA – The World Factbook". CIA.gov. Retrieved 2012-09-01. ^ "Improving IC Engine Efficiency". Courses.washington.edu. Retrieved 2012-03-30. ^ "Carnot Cycle". Hyperphysics.phy-astr.gsu.edu. Retrieved 2012-03-30. ^ Preston, John L. (October 1994). "Comparability of Supply- and Consumption-Derived Estimates of Manufacturing Energy Consumption" (PDF). ^ "U.S. Greenhouse Gas Inventory Report". U.S. EPA. April 2012. Retrieved 2012-09-01. ^ Teixeira, Ruy (2007-06-14). "Public Opinion Snapshot: Public Wants Action on Energy and the Environment". ^ "Public Priorities: Deficit Rising, Terrorism Slipping." Pew Research Center for the People and the Press RSS. N.p., n.d. Web. 19 Jan. 2013. ^ Jeffrey M. Jones, Americans Still Divided on Energy-Environment Trade-Off, Gallup. ^ "Mission". Whitehouse.gov. 2012-09-01. Retrieved 2012-09-01. ^ "USPTO Expands Green Technology Pilot Program to More Inventions". ^ "Emerging Energy and Intellectual Property – The Often Unappreciated Risks and Hurdles of Government Regulations and Standard Setting Organizations". The National Law Review. ^ "USPTO Extends Deadline to Participate in Green Technology Pilot Program by One Year". Fight Climate Change Fast, changing our energy system.